What ever happened to "Six Sigma"? GE was one of the most beloved and hyped S&P500 stocks during the late-nineties Bubble Era. With "visionary" Jack Welch at the helm, GE was being transformed into a New Age industrial powerhouse - epitomizing the greater revolution of the U.S. economy into a technology and services juggernaut. GE evolved into a major financial services conglomerate, riding the multi-decade wave of easy high-powered contemporary finance and central bank backstops. GE Capital assets came to surpass $630 billion, providing the majority of GE earnings. Wall Street was ecstatic - and loath to question anything. GE certainly had few rivals when it came to robust and reliable earnings growth. Street analysts could easily model quarterly EPS (earnings per share) growth, and GE would predictably beat estimates - like clockwork. Bull markets create genius. It's only fitting. With a multi-decade Credit Bubble having passed a momentous inflection point, there is now mounting concern for GE's future. Welch's successor, Jeffrey Immelt, announced in 2015 that GE would largely divest GE Capital assets. These kinds of things rarely work well in reverse. Easy "money" spurs rapid expansions (and regrettable acquisitions), while liquidation phases invariably unfold in much less hospitable backdrops. Immelt's reputation lies in tatters, and GE today struggles to generate positive earnings and cash-flow. When markets are booming and cheap Credit remains readily available, Wall Street is content to overlook operating cash flow and balance sheet/capital structure issues. Heck, a ton of money is made lending to, brokering loans for and providing investment banking services to big borrowers. That has been the case for the better part of the past decade (or three). No longer, it appears, as rather suddenly balance sheets and debt matter. After ending 1994 with Total Liabilities (TL) of $158 billion (total equity $28bn), GE TL closed the nineties at $357 billion. Over the subsequent five boom years, TL increased to $382 billion, $425 billion, $507 billion, $563 billion and then 2004's $627 billion. TL peaked in Q2 2008 at $720 billion (total equity $127bn). A slimmed down GE ended Q3 2018 with TL of $263 billion supported by $48 billion of Total Equity. GE finished the quarter with Short-Term Debt of $15.2 billion and Long-Term Debt of $100 billion. GE CDS (Credit default swap) prices surged 24 bps Friday and 86 bps for the week, to 259 bps. This was after beginning 2018 at 41 bps. It's worth noting that GE CDS closed this week at the highest level since the Fed "exit strategy" mini-panic back in 2011. But rather than commencing an exit from its bloated crisis-era balance sheet, the Fed proceeded over the next three years to double holdings again, to $4.5 TN. This extended GE's lease on life, along with the fortunes of scores of aggressive borrowers. Perhaps a $9.0 TN Fed balance sheet could save GE. Most of GE's long-term debt is rated BBB+, "investment grade" but only a couple notches from high-yield (BB+). The worry is that downgrades will push GE debt to junk, forcing liquidation by funds and holders restricted to investment-grade holdings. "Moneyness of Risk Assets" has been a key analytical construct throughout this reflationary cycle (an evolution of "Moneyness of Credit" from the mortgage finance Bubble period). Fed (and global central bank) rate, QE, and market backstop policies incentivized (coerced) savers into the risk markets, especially in perceived lower-risk equities and fixed-income. With market yield way below investment return bogeys, many (pensions managers) were compelled to boost returns with leverage. Literally Trillions flowed into perceived safe and liquid "money-like" ETF shares. This flood of "money" into (higher yielding vs. CDs and Treasuries) investment-grade ETF products ensured the easiest Credit Availability imaginable for companies to borrower for capital investment or, more often, stock buybacks and M&A. November 16 - Bloomberg (Brian Smith and Jeremy Hill): "Investment-grade bond spreads surged to the widest level in two years as a rash of concerns about corporate debt dented investor confidence. The spread on the Bloomberg Barclays U.S. IG Corporate Bond Index widened to 128 bps over Treasuries at the close Thursday, the widest since December 2016. The 6 bps jump was the most since the Brexit vote two years ago. Bond 'buyers have been relatively indifferent to corporations, and they focused more on rating,' said David Sherman, president of Cohanzick Management LLC. 'And now they're starting to bifurcate the 'haves' and the 'have-nots.''" November 15 - Reuters (Trevor Hunnicutt): "U.S. fund investors are maintaining a wary position when it comes to bonds, pulling more cash after record withdrawals in October, Lipper data showed… Taxable bond mutual funds and exchange-traded funds (ETFs) based in the United States posted $1.2 billion in withdrawals during the week ended Nov. 14, Lipper said. Investors pulled $131 million from municipal bond funds in the eighth straight week of withdrawals for those products. In October, more than $53 billion tumbled out of U.S.-based taxable bond funds, the largest withdrawals on records dating to 1992, according to Lipper." Losses are mounting, and liquidity is waning. U.S. corporate Credit is losing its "moneyness," with profound financial and economic ramifications. The June 2007 subprime eruption marked the inflection point for the "moneyness" of mortgage Credit. The "marginal" borrower/buyer lost access to cheap Credit, commencing a spectacular cycle's downside. Yet it was when the marketplace questioned the safety and liquidity of previously perceived "moneylike" "AAA" mortgage securities (and the money market borrowings of those heavily leveraged in "AAA"!) that full-fledged crisis took hold. I remember the argument all too well. "Subprime doesn't matter." Arguing that losses would amount to no more than $40 to $50 billion, subprime was viewed by many in late-2007 as almost trivial in comparison to U.S. wealth in the many tens of Trillions. The market in "BBB" corporates has ballooned during this cycle to about $3.0 TN. With the U.S. economy and stock market booming, "BBB" has been viewed as virtually bulletproof. Well into 2008, "AAA" was bulletproof. With major outflows from investment-grade funds, Credit availability is now tightening for the "marginal" "BBB" Credits. Tighter Credit conditions pressure GE and other borrowers that have for years feasted on the loosest finance ever. Heavily levered companies will face higher - in some cases significantly higher - rates when refinancing debt. This should mark a key inflection point for stock buybacks and M&A. These firms will also be vulnerable to the downside of the Credit Cycle, with deteriorating economic prospects and deflating asset prices. Risk is high that huge quantities of "BBB" rated bonds will turn to junk ("fallen angels"). And as one issuers stumbles, a nervous marketplace will be fret the next victims of a rapidly tightening marketplace. Contagion at the "Core." In the event of a major liquidation, who will step up to buy? November 16 - Fitch Ratings: "Fitch Ratings has downgraded PG&E Corporation's (PCG) and Pacific Gas and Electric Company's (PG&E) Long-Term Issuer Default Ratings (IDR) to 'BBB-' from 'BBB' and placed them on Rating Watch Negative… The rating action reflects the enormous increase in the size, intensity and destructive power of wildfires in California during 2017-2018, the implications of potential, vastly increased third-party liabilities under inverse condemnation and uncertainties regarding full and timely recovery of such costs. How time flies. It's now been about six weeks since Chairman Powell's 'we're a long way from neutral at this point, probably." GE CDS has about tripled (83 to 259 bps) over this short period, while investment-grade corporate (Bloomberg/Barclays) spreads have surged from 105 to an almost three-year high 128 bps. Especially with this week's dramatic widening of corporate spreads, the Fed's attention has surely been piqued. A pullback in equities is not only unalarming to Federal Reserve officials, it's likely welcomed. The prospect of illiquidity and dislocation in corporate Credit sets alarm sirens blaring. November 16 - CNBC (Jeff Cox): "The Federal Reserve is close to the point of being 'neutral' on interest rates and should predicate further increases on economic data, the central bank's vice chairman said Friday. Recent appointee Richard Clarida told CNBC's Steve Liesman that nearly three years of increases have brought the Fed's short-term interest rate near where it is neither restrictive nor stimulative, a key consideration when considering the future path of monetary policy. 'As you move in the range of policy that by some estimates is close to neutral, then with the economy doing well it's appropriate to sort of shift the emphasis toward being more data dependent,' Clarida said…"
Two-year Treasury yields sank 12 bps this week to 2.81%. Chairman Powell struck a balanced tone during his Wednesday evening presentation, falling short of the full retreat from relative hawkishness the market was yearning for. About 36 hours (and 50 bps added to GE CDS) later, vice chairman Clarida got closer to the mark. I'll assume the White House similarly recognizes the rapidly deteriorating financial backdrop. The President's Friday comments ensured a positive end to an ominous week. November 16 - Bloomberg (Shannon Pettypiece and Shawn Donnan): "President Donald Trump said he is optimistic about resolving the U.S. trade dispute with China after receiving a response to his demands from Beijing, ahead of a widely anticipated meeting with China's Xi Jinping in Argentina… Trump told reporters Friday that the Chinese response was largely complete but was missing four or five big issues, signaling that tough discussions still need to take place between the two sides as they head into the Nov. 30-Dec. 1 meetings… "China wants to make a deal… They sent a list of things they are willing to do, which is a large list and it is just not acceptable to me yet. But at some point I think that, we are doing extremely well with respect to China.'" President Trump added, "I don't want to put them in a bad position. I want to put them in a great position." This was a notably softer tone than the borderline gloating from a few weeks back (with Chinese stocks in a tailspin and U.S. equities hovering near all-time highs). I took exception with the President's approach back then. Not only would it surely enrage Beijing, I'm reminded of the old, "If you live in a glass house, don't throw stones". With Global Crisis Dynamics having landed at the Core, latent U.S. fragilities have begun bubbling to the surface. This may motivate the administration to ink a trade deal with China. On the other hand, it may strengthen Chinese resolve. Beijing may see the advantage of playing long ball, believing their tightly controlled system is better prepared today to weather a global crisis than their U.S. competitor. As for Global Crisis Dynamics, markets seem to turn more unstable by the week. There must be excruciating pain out there in the leveraged speculating community. The crude liquidation ran unabated this week, with (December) WTI sinking another $3.73 to $56.46. In a stunning move for such a major market, WTI is now down 25% from October 3rd highs ($76.72). And if you had a "pairs trade" long crude against a short in natural gas, you had a really miserable go of it. Natural gas traded to $4.93 intraday in Wednesday's session, up over 50% since October 3rd. Speaking of pain, Italian 10-year yields were up another nine bps this week to 3.49%. And with German bund yields down four bps (0.37%), the Italian to German yields spread widened 13 to 312 bps. Italian banks were slammed 3.8%. Greece CDS jumped 24 bps to a near one-year high 417 bps. European periphery bonds were under pressure, with spreads (to bunds) widening 23 bps in Greece, eight bps in Spain and seven bps in Portugal. While markets would like to take a constructive view of the less hawkish tone from Fed officials, there's little the Fed can do to sooth unstable markets. At this point, speculators are positioned for higher rates and yields. Sudden dovish talk sparks a reversal of hedges in the Treasury market, with sinking yields only exacerbating spread widening (and deleveraging) throughout corporate Credit. Five-year Treasury yields sank 16 bps this week. The unstable MBS marketplace saw benchmark yields drop 14 bps. It's also a fair assumption that the speculators are positioned long the U.S. dollar, especially versus the emerging market currencies. Clarida's Friday morning comments heightened currency market volatility, with the dollar index declining 0.5%. The heavily shorted emerging equities (EEM) ETF rallied 2.8% this week. Rather ominously, Mexico didn't participate in the rally. Mexican equities sank 4.4%, as 10-year (peso) yields surpassed 9.0% for the first time in years. Mexico's CDS jumped 11 to 146 bps. Here at home, Goldman Sachs CDS surged a notable 22 to 91 bps, the high going back to January 2017. Morgan Stanley (+13), Bank of America (+10), Citigroup (+10) and JPMorgan (+10) all posted double-digit CDS price increases this week. But it was the 13 bps jump in investment-grade spreads (to 2-yr highs) that I place at the top of this week's notable market developments. The LQD investment-grade ETF closed Thursday at the lowest level since 2011 (negative 5.3% y-t-d return). So, my bearish imagination returns to the $3.0 TN of BBB corporate bonds. How much is held by investors that have little appreciation for mounting risks? How vulnerable are ETFs to a run? How much corporate Credit is held on leverage? Heavy leverage imbedded in derivatives? And is it outrageous to ponder the speculator community moving to deleverage, anxious to get out in front of a surge of ETF outflows? Markets this week appeared to begin discounting a troubling scenario in corporate Credit. I believe we are also beginning to witness a historic inflection point with respect to economic structure. If a major tightening in financial conditions and corporate Credit Availability is now unfolding, then there are enormous numbers of uneconomic and negative cash-flow enterprises that face Rude Awakenings. As the New York Times put it, "General Electric may be the Canary in the Credit Market's Coal Mine." November 16 - Bloomberg (Lisa Lee): "The U.S. leveraged loan market's benchmark price index dropped to a two-year low yesterday as credit and equity markets slumped. Besides negative vibes from the junk bond market, investors blame an increase in supply as issuers piled in to capitalize on robust demand for floating rate assets. 'We have these pockets where supply catches up to demand,' said Chris Remington, portfolio manager at Eaton Vance, one of the biggest U.S. investors in leveraged loans…"
Notable as well this week, new China Credit data. November 13 - Reuters (Kevin Yao and Lusha Zhang): "China's credit growth slowed sharply in October, despite pressure by regulators on banks to help keep cash-starved companies afloat, pointing to further weakening in the economy in coming months. While October is typically a slow month for Chinese credit, growth in key gauges such as total social financing and money supply fell to record lows, reinforcing views that policymakers will need to step up efforts to revive flagging investment… Chinese banks extended 697 billion yuan ($100.23bn) in net new yuan loans in October…, much less than expected. Analysts polled by Reuters had predicted new loans of 862 billion yuan in October, down from 1.38 trillion yuan in September… Household loans, mostly mortgages, fell to 563.6 billion yuan from 754.4 billion yuan in September. Household loans accounted for 80.9% of total new loans in October, versus 54.7% in the preceding month…"
China Aggregate Financing dropped to 579 billion yuan ($84bn), down from September's 1.178 TN ($171bn), to the lowest monthly Credit expansion since July 2016 (479bn yuan). Estimates were at 1.300 TN yuan. After 10 months, y-t-d Aggregate Financing of $1.925 TN ran 20% below comparable 2017. And while new bank loans slowed sharply from September (and recent months), it was still up somewhat from October 2017. Consumer Bank Loans slowed in October, although were still 25% above October 2017. Year-to-date new Bank Loans were up 17% from comparable 2017 (y-t-d Consumer loans up 18%). Meanwhile, "shadow bank" lending contracted (268bn yuan) in October. The drop in global equities in October was remarkable for its extent, the frequency of consecutive negative days, and the synchronised decline in all the major markets. The most likely fundamental trigger for the severity of the equity correction was an increase in investors’ perceptions of downside, or even recessionary, risks to the global economy. Dramatic talk about trade wars obviously exacerbated the drop in confidence. The flow of economic data (see the latest “nowcasts” in the box below) suggests that there was, indeed, a decline in world activity during October. In fact, the global growth rate clearly peaked late in 2017, since when there has been a noticeable reversion to the mean. The period of above-trend growth that was so powerful last year proved short lived, and now seems to have been mainly cyclical, rather than secular, in nature. However, the slowdown will be met with important policy adjustments, notably in China. Furthermore, temporary downward shocks to growth in the Eurozone (car emissions regulation) and Japan (natural disasters) will disappear. 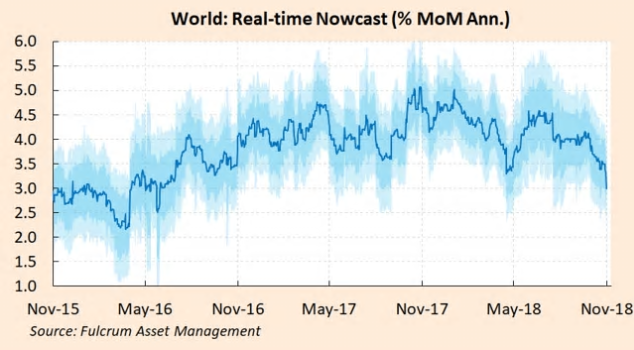 The weakening profile for global activity is therefore likely to represent nothing worse than a “return to normal” and, in the absence of new downward shocks, will not develop into a full blown global recession within a 12-24 month forecasting horizon. According to the latest nowcasts, activity growth in the world economy has slowed from a peak of 5 per cent a year ago to only 3 per cent now, about 0.7 per cent below trend. Much of this decline has occurred in the last couple of months. Growth has declined almost everywhere. 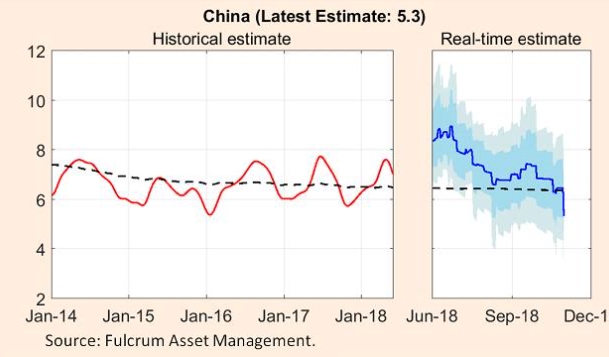 China has slowed from 7.4 per cent a year ago to 5.3 per cent now, the lowest growth rate since the serious downturn in 2015. The Eurozone has also reported disappointing data throughout 2018, and the latest dip in October has taken growth down to only 1.1 per cent. In contrast, the US has been a beacon of strong growth throughout the year, bucking the global pattern. US: Fiscal and monetary policy will be far less supportive next year than in 2018. The positive fiscal thrust will drop from a peak of 0.8 per cent this year to zero at the end of next year, assuming no further measures to reduce taxes or raise infrastructure spending after the mid term elections. The sharp turnround in these policy measures will probably take growth well below its 2 per cent trend rate by end 2019. This slowdown, however, is a healthy development, given the concerns about severe overheating in the labour market. The Eurozone and UK: The outlook here is quite hard to judge. Growth has already slowed sharply in 2018, reflecting adverse weather and a waning of monetary policy support, compared to last year. There were tentative signs of improvement around mid year, but Germany has been severely knocked off course by the change in emissions regulation in the car industry, causing a large new setback in business surveys in October. Meanwhile, Italy has been dented by the budget crisis this autumn. Nevertheless, business and consumer confidence remain fairly robust, and the labour market is strengthening. The ECB is confident that underlying growth remains firmly around trend, and that seems like a sensible estimate for next year. This weakening has coincided with an increase in trade threats from Washington, and the politburo has now admitted that the economy is being affected by “external forces”. They now seem ready to act more aggressively to boost private sector activity, following the moderate easing in monetary policy and the decline in the exchange rate around mid year. The latest policy statements place less emphasis on deleveraging and more on boosting private infrastructure spending than earlier announcements, and this should show up in monetary and other activity data before year end. However, the outlook for 2019 also depends on whether Presidents Trump and Xi can move towards detente on trade policy, as hinted by their latest telephone discussions ahead of the G20 Summit this month. The Global Economy: A significant slowdown in the US looks likely, but this should be offset by a rebound in the Eurozone, China and Japan after temporary hits to growth dissipate, and Chinese policy easing takes effect. Growth may be around trend in 2019, slightly higher than the latest nowcast. 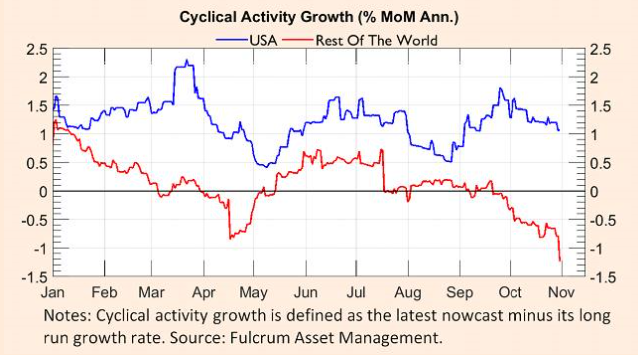 The latest monthly report on global economic activity from the Fulcrum nowcast models is attached here. 1. The global economy has slowed noticeably in the last couple of months. 2. The main cause is a drop in Chinese activity . . .
3. The US economy remains very robust and continues to grow 1 per cent above trend. Meanwhile, the rest of the world has now slowed to 1.3 per cent below trend . . .
4. 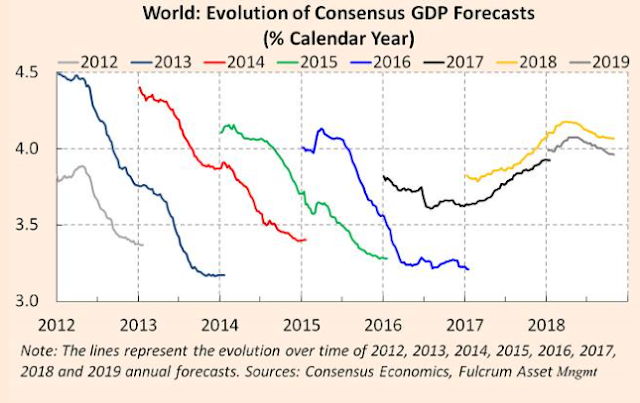 Consensus economic forecasts expect global GDP growth to be slightly lower in 2019 than this year. Downside risks may be building at present and consensus forecasts have been moving slightly lower . . . THE BIG hair, shoulder pads, splashy videos and tinny recordings were hard to escape at the time. But where are the pop stars of the 1980s now? At an arena near you, most probably. Though the waists are thicker and the hair is thinner, the singers and their songs are recognisably the same. In their own minds, they are still big stars. It was the music business that got small. No sub-genre of pop is so lamentable that it cannot be resold to the nostalgic. Might such marketing magic also be applied to Japan’s stockmarket? In the 1980s asset prices in Japan reached a level of excess that made the cocaine-addled pop stars of the era seem like choirboys. By 1990 the Nikkei index of stocks was trading at 60 times company earnings. Then came the fall. But after a long time in rehab, Japanese stocks are creeping back into the spotlight. Like other mooted revivals, this one attracts plenty of scorn. 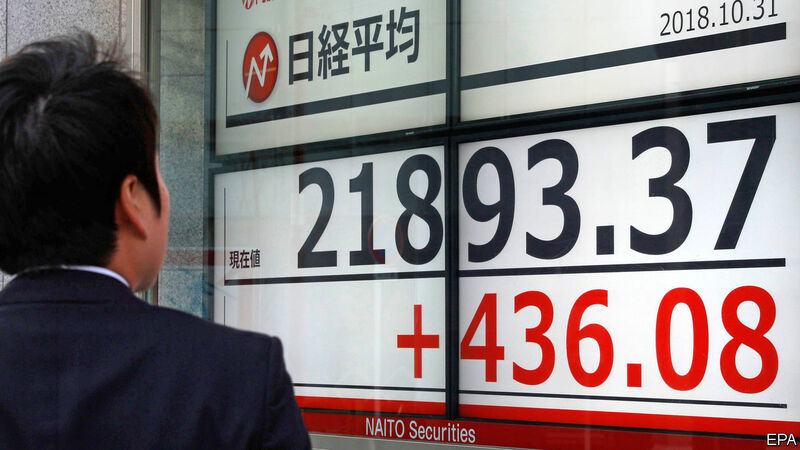 Repeated attempts to call the bottom of the Japanese market have made fools of foreign investors. Japanese companies are not known for making shareholder returns a priority. And why invest in a country with an ageing and shrinking workforce? For these and other reasons, big global funds have been underweight Japan. But who can resist a comeback story? For the first time in years, Japanese companies are playing a tune that investors are able to whistle. The key change is that listed firms in Japan are using shareholder funds more effectively. 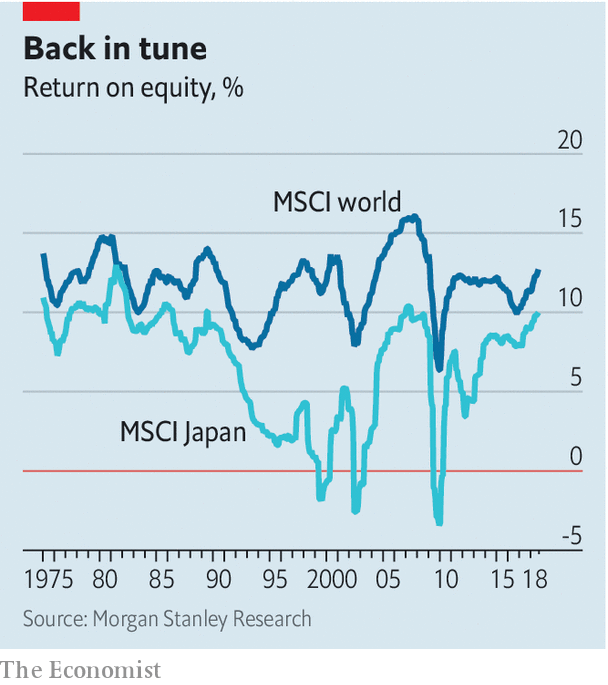 As a new report from analysts at Morgan Stanley points out, return on equity (RoE) has lagged well behind global standards for most of the past three decades. But since 2012 the gap has narrowed. Japan’s RoE has doubled, to 9.8% (see chart). Much of the improvement can be traced to cuts in corporate taxes and a reduction in debt-servicing costs because of lower interest rates. But it is also down to better control of costs and the sweating of corporate assets. A healthier economy has helped, too. Deflation has ended. Nominal GDP has been growing steadily. And the job market is buoyant. Unemployment has fallen to 2.3%. The ratio of vacancies to jobseekers is the highest since the early 1970s. More women than ever are in the workforce—the female participation rate is higher than in America and above average for the OECD. Output per hour has recently grown faster in Japan than in any other G7 country, according to the Conference Board, a research group. Less noticed, perhaps, are changes at the company level. Corporate Japan remains a cosy place; the custom of cross-shareholdings, in which companies own equity stakes in each other, created a core of friendly stockholders who don’t rock the boat. But a recent spate of governance reforms has shaken things up a bit. The vast majority of companies now have at least two independent directors. There are more female board members. And firms are less likely now to schedule their shareholder meetings on the same day as each other—a tactic to deter awkward questions for managers. The firms themselves are investing. Private-sector capital spending has risen for seven consecutive quarters for the first time since the 1980s. In an economy with a shortage of labour, people are more likely to be open to automation. Japanese firms already hold sway in key parts of the robotics industry. Increased automation will help Japan close the RoE gap with its peers by 2025, says Morgan Stanley. A higher premium on Japanese stocks would then be warranted. Reaching that target would depend on Japan sticking with “Abenomics”, the expansionist policies of the prime minister, Shinzo Abe. It would also require buy-in from global fund managers. They are used to thinking of China and other emerging markets as the alternatives to investing in America, passing over Japan and Europe as has-beens. But fashions change, in investing as in popular culture. Time in the wilderness can be used to great effect. In order to have a comeback you must first have a setback—a wise observation by that icon of 1980s popular culture, Mr T.
When outgoing Greek Foreign Minister Nikos Kotzias announced last month that Greece intended to expand its territorial waters from six nautical miles off the coast to 12 nautical miles, it reignited a dispute that had been simmering for decades. 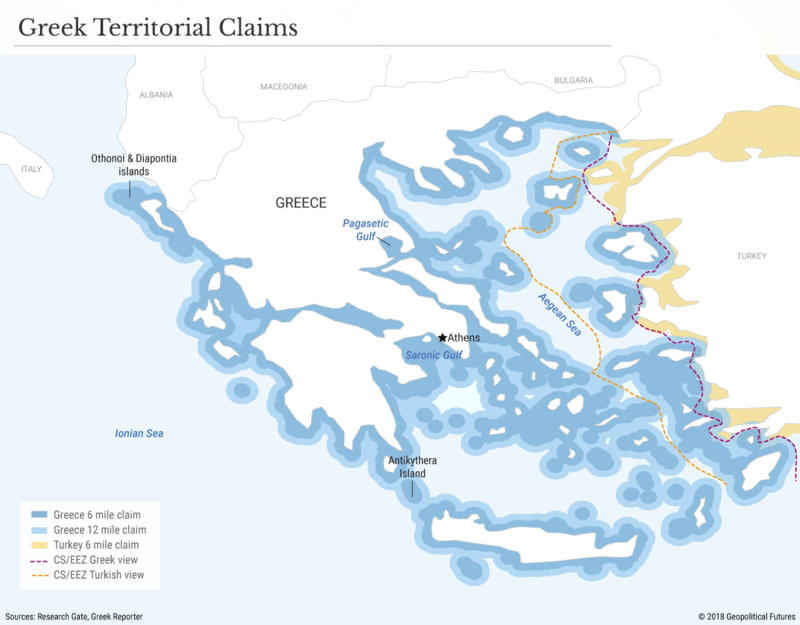 It may seem like a minor change at first glance, but Greece has thousands of islands scattered throughout the Aegean and Ionian seas, so expanding its territorial limits will have outsize effects on the region. According to Kotzias, the first planned extension will be to Greek territory in and along the Ionian Sea – from the island of Othonoi to the island of Antikythera. Then, Greece plans to expand the extension to its east coast, from Antikythera to the Saronic Gulf and then through the Pagasitikos Gulf in the Aegean Sea. This is where it has run into opposition, namely from Turkey, which has major ports along the Aegean and depends on free passage through this sea to access the Mediterranean. Turkey has long been at odds with Greece over control of the Aegean, and predictably responded with stern warnings. It summoned Greece’s ambassador to Ankara and released a statement reminding Athens of a 1995 declaration by the Turkish parliament that Greek expansion of territorial boundaries beyond six nautical miles would be considered “casus belli,” or grounds for war. In response, Greece has decided to refer the matter to parliament, instead of passing the change through presidential decree as originally intended. Greece has argued that it has a right under the United Nations Convention on the Law of the Sea to extend its maritime borders to 12 nautical miles, the maximum allowed by the treaty. (Turkey is one of few countries, along with the U.S., that hasn’t ratified UNCLOS, which has more than 160 signatories.) Since 1936, however, Greece has claimed sovereignty over only six nautical miles from its shores. (Prior to this time, it had control over only three nautical miles.) Turkey wants to keep it that way, claiming that the Aegean is a special case given the proximity of Greek islands to the Turkish coast. According to the Turks, UNCLOS shouldn’t apply there and the issue must be settled through bilateral talks. Turkey has effectively drawn a red line in the Aegean Sea, and it’s not hard to understand why. If Greece were to extend its territorial control to 12 nautical miles, it would create a potential chokepoint in Turkey’s access to the Mediterranean, forcing Turkish vessels departing from, say, the Bosporus (arguably Turkey’s most valuable strategic asset) or even Izmir (a major port on the Aegean) to navigate through Greek-controlled waters. The extension would increase Greek jurisdiction over the surface area of the Aegean from 43 percent to 71 percent, and reduce international waters from 49 percent to 19.7 percent. It would also increase Turkish claims over the sea, from 7.5 percent to 8.8 percent, but navigation through these waters could still be hampered for the Turks by its historical adversary, an unacceptable proposition for Ankara. While UNCLOS does allow for “innocent passage” through sovereign territorial waters, there are restrictions. For example, states are prohibited from carrying out military exercises that involve any sort of weapons, and submarines that travel through the waters must remain above the surface. There are also restrictions on loading or unloading any commodities in violation of the laws and regulations of the coastal state and conducting research or survey activities, which Turkey needs to do if it’s to secure access to natural gas supplies in the Eastern Mediterranean. Enforcement measures for UNCLOS are notoriously weak, but the European Union has backed Greece’s right to extend its territorial control. It’s undoubtedly a worrying development for Turkey, which has increasingly squared off against European countries over drilling rights in the Eastern Mediterranean. And if Greece does extend its territorial boundaries, Turkey may not be able to carry out military exercises in these waters to intimidate other countries competing for natural resources there or block European vessels from accessing drilling rigs, at least not without violating UNCLOS, which could draw an EU response. Extending the maritime boundary by six nautical miles won’t really change much in the balance of power between Greece and Turkey. The balance of power between two states is defined not by what either side says it controls but by the military hardware and forces it has to back up its claims. Still, it’s a good litmus test for Greek power. If Greece can extend control by six nautical miles without a Turkish challenge, it would demonstrate that Greece is more powerful than it previously was and than many believed it to be. Conversely, if Turkey can push back, it’ll be a sign of the limits of Greek power. Why is Greece making this move now? One possible reason is that it’s looking for ways to push back against Turkey’s recent moves around Cyprus and to test how far Turkey is willing to go there. The long-standing dispute between Greece and Turkey over Cyprus – an island split between a majority Greek Cypriot population in the south and a minority Turkish Cypriot population in the north – has remained relatively calm for decades but has intensified this year. In February, Turkey blocked an Italian ship contracted by energy firm Eni en route to explore for natural gas in Cyprus’ exclusive economic zone, claiming that Cyprus had given access to a portion of its EEZ that actually belonged to the breakaway Turkish Republic of Northern Cyprus, a state recognized only by Ankara. In October, the Turkish navy blocked a Greek frigate that Turkey claimed was trying to obstruct a Turkish energy exploration ship operating in the region. And on Wednesday, Turkey announced its own deep-sea drilling vessel, the Fatih, had begun drilling off Turkey’s southern coast, near Cyprus. For Turkey, having access to natural gas reserves off Cyprus is about more than money. Turkey is highly dependent on imported natural gas to meet its growing energy needs. 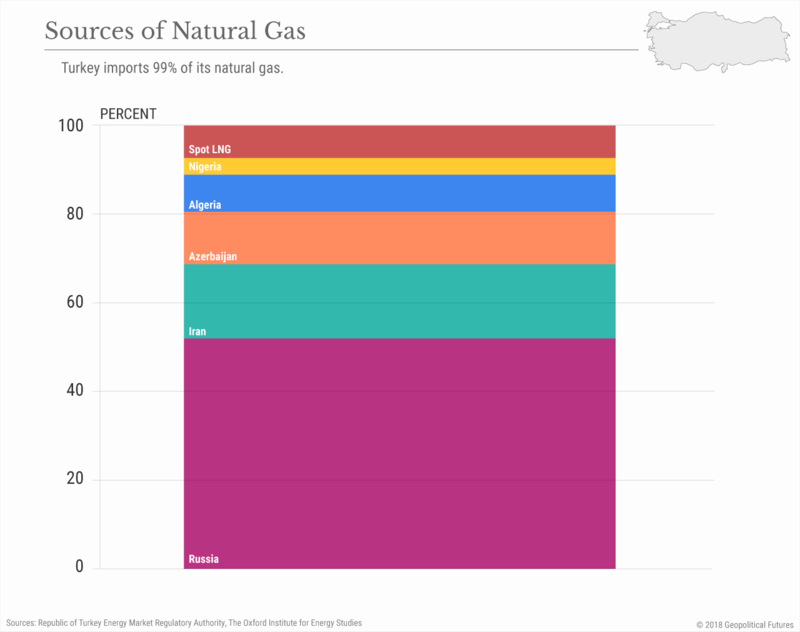 Natural gas accounts for roughly 27 percent of Turkey’s energy consumption, and about 99 percent of its supply is imported. In 2017, its natural gas consumption reached a record high – 53.5 billion cubic meters – and over 50 percent of this supply came from Russia. Its second-largest supplier, Iran, supplied 17 percent. So long as Turkey remains dependent on these countries for natural gas, its strategic flexibility will be limited. For Greece, Turkey’s assertiveness in the Eastern Mediterranean is concerning because it demonstrates a willingness to use force in pursuit of economic interests. To that end, Turkey may be willing to establish a greater military presence closer to Greek shores. In any case, Athens has been suspicious of Turkey’s intentions for many years. Greece’s move this week to end its diplomatic spat with Russia over Moscow’s alleged undermining of the deal on the Macedonia name dispute may be a hint that Greece wants more allies in its corner should any conflict with Turkey erupt. Although it’s unlikely that Turkey would want direct confrontation with Greece, given that it’s already engaged in northern Syria, it can’t be ruled out completely. After all, Turkey invaded Cyprus in 1974 following a Greek-backed military coup on the island, even though both countries were already NATO members at the time. They almost went to war again in 1987 and 1996 over similar issues. That the Greek prime minister is turning the decision on maritime borders in the Ionian Sea over to parliament indicates he’s not willing to press the issue, at least not for now. (Though he may also be looking for parliamentary approval so he can avoid blame if the move ignites a conflict with Turkey.) The real test would come if the Greek parliament decided to move ahead. At that point, the Greek government would be faced with a tough decision: back down or risk possible confrontation with a NATO ally, however unlikely. If it chooses the latter, the Turks would then have to decide how to respond. If a conflict were to break out, there would be consequences beyond Greece and Turkey. A war between two NATO allies could substantially weaken the alliance or even lead to Turkey’s expulsion. When they confronted each other in 1974, the Soviet Union was still a considerable threat, and Turkey was a key part of the containment line, which limited how widely the conflict could spread. Today, Russia poses nowhere near the danger the Soviets once did, and thus the alliance isn’t as secure as it once was. Still, so long as Turkey is unable to independently defend itself from Russia, it needs NATO as a shield, and it’s therefore unlikely to challenge a NATO ally and risk incurring the consequences. For any serious student of history, one of the great realisations that occurs at some point is that governments are inherently controlling by nature. The more control they have, the more they desire and the more they pursue. After all, governments actually produce nothing. They exist solely upon what they can extract from the people they rule over. Therefore, their personal success is not measured by how well they serve their people, it’s measured by how much they can extract from the people. But, they couldn’t be more incorrect. There are many people, worldwide, but particularly in the centres of the present deterioration – the EU and US – who feel that, since the situation in their home country is nearing collapse, the entire world must also be falling apart. This is not only a very myopic viewpoint, it’s also quite inaccurate. At any point in civilization in the past 2000 years or more, there have always been empires that were collapsing due to intolerable governmental dominance and there have always concurrently been alternative jurisdictions where the level of freedom was greater. In ancient Rome, when Diocletian devalued the currency, raised taxes, increased warfare and set price controls, those people who actually created the economy on a daily basis found themselves in the same boat as Europeans and Americans are finding themselves in, in the 21st century. Sadly, we live in a period in history in which some of the nations that once held the greatest promise for the world are well on their way to becoming the most tyrannical. If by recognizing that fact, we can pursue better alternatives elsewhere on the globe, as people have done in previous eras. 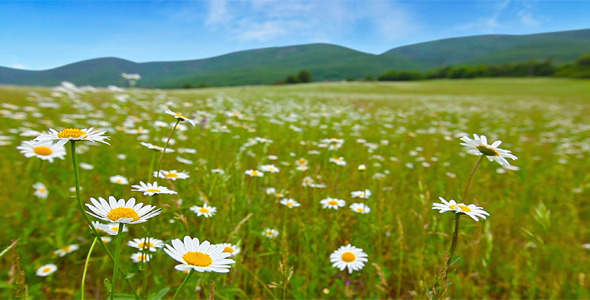 We may actually find that the field of daisies in the image above is still very much in existence, it’s just a bit further afield than it was in years gone by.